We openly welcome everyone interested in the pipe organ to the society and to our website; be them a professional player, amateur player or simply a lover of the pipe organ and its music. We are an active society with interesting regular visits to see, listen to and play organs from large cathedral organs to small house organs, mainly pipe but also electronic. We run and take part in educational lectures and presentations, recitals, workshops and master classes, organ and organ builder visits, organ crawls as well as enjoyable social events. The society offers an opportunity for members to meet fellow enthusiasts sharing a common interest in the pipe organ whilst gaining access to members who can deputise, teach or advise on the organ as well as advertising organist appointment opportunities. We publish a termly newsletter called ‘Soundboard‘ full of fantastic information about all things organ, reviews of our events and articles. Recent issues can be accessed via the website menu. The Society was established in 1932 and continues to be one of the most active and successful Organ Societies in the UK. Click here for details of our all exciting society events and recital/concert lists. N.D.S.O. Ties – Get Yours Now! Only a few Society ties remain available from our President or Secretary at the very reasonable price of £5.00 each. They come in striking Blue or Burgundy and feature our logo. This is a tie that you can wear with pride to any NDSO event or indeed a concert to indicate to everyone that you are a valued member of our wonderful society. Get one before they are all sold out! 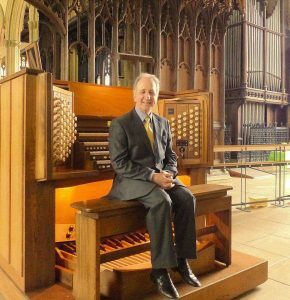 Copyright © Nottingham & District Society of Organists 2018. All Rights Reserved.